School Games Mark Success in 2014! Congratulations to the 33 Wandsworth Schools who were recently awarded the Sainsbury's School Games Mark 2015. This was a fantastic achievement with 13 Silver and 20 Bronze Awards. 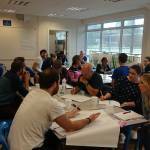 25 PE Co-ordinators from Wandsworth Primary schools came along to the first Active Wandsworth Primary PE Forum of the year at Southfields Academy on 10th October 2014.